You may have heard that Aquaman, the aquatically inclined DC Comics superhero, is technically a Mainer — a fact we here at the BDN discovered after the hit movie starring Jason Momoa came out in December. As it turns out, Aquaman is not the only superhero with Maine roots. There’s another specially powered person who’s from the Pine Tree State, though this one is from the Marvel Comics universe. Yes, that’s right: Captain Marvel, a.k.a. Carol Danvers, the newest Marvel character to get her own movie — which is out in movie theaters everywhere this weekend — is also a Mainer. Danvers’ Maine origins are a slightly more recent addition to the lore of Captain Marvel, a character that’s undergone quite a few transformations since she first appeared in the late 1960s. In fact, confirmation of her childhood in Harpswell, Maine, didn’t come until just last year, with the publication of “The Life of Captain Marvel,” a limited comic book series written by longtime Marvel writer Margaret Stohl that explored Danvers’ past and how she came to get her powers. The series is almost entirely set in Maine in a fictionalized Harpswell and surrounding area, rife with lighthouses, lobster boats and slightly embarrassingly written Maine accents. A warning: Spoiler alerts for the book (and maybe the movie) follow. The comic starts with Carol coming home to visit her mom, Marie, and brother in Harpswell, the coastal Cumberland County town where she spent much of her childhood, splitting her time between there and Boston. Through lots of flashbacks, the comic shows Carol in her younger years, including her diving off rocky cliffs into the ocean, helping her father pull lobster traps and eating doughnuts at Sugar’s Donuts (a stand-in for Frosty’s Donuts in Brunswick). It also shows the physical abuse she suffered at the hands of her father. While she’s back home in Harpswell, her brother gets into an accident and is severely injured, causing Carol and her mother to reconnect while they care for him. During that down time, they begin to share some long-held family secrets. Meanwhile, unbeknownst to anyone, a mercenary from the Kree, a super-powerful alien race, is sent to Maine to hunt Carol down. Bonus points to the writer and illustrators of this series for showing a Kree stealing a lobster boat and piloting it through the harbor. When the mercenary finally reaches the Danvers family, it’s revealed that she is not there for Carol — she’s there for Carol’s mother, Marie. Marie Danvers, as it turns out, is actually Mari-Ell, a Kree warrior sent to Earth decades earlier, who fell in love with Carol’s father, Mainer Joe Danvers. Carol Danvers’ real name is Car-Ell, and she is half-Kree, half-human, which is how she gets her powers, and not from a freak accident, as she originally assumed. Marie and Carol battle the Kree mercenary, destroying half of Harpswell in the process. Marie is killed, and after grieving for her mother — who she only found out was a Kree warrior in the moments before she died — Carol rejoins her friend Tony Stark (Iron Man) and the Avengers. 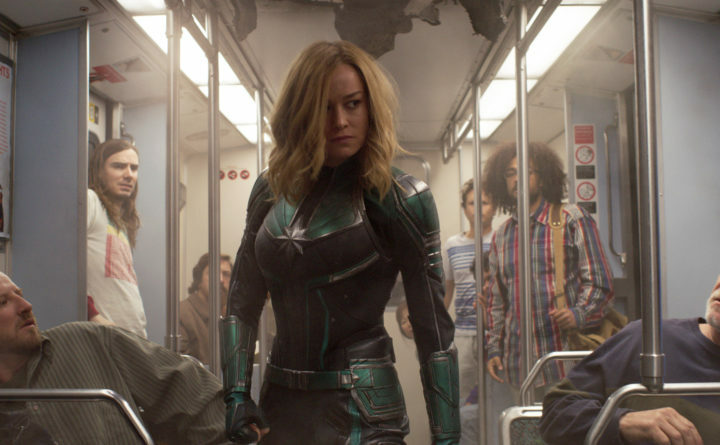 It remains to be seen what, if any, of these plot points appear in “Captain Marvel,” and if any of Maine will show up in the movie — but as far as the actual comics go, the current version of the character is written as a Mainer. It’s interesting that Aquaman and Captain Marvel, despite being from different comic universes, share some similarities in terms of how they, both the children of either superhuman or extraterrestrial mothers, came to have ordinary human Mainer fathers. Is Maine a particularly good place to raise a future superhero? Does the dye in red hot dogs give you enhanced abilities? Did Carol gain her exceptional skills as a fighter pilot by driving on pothole-ridden Maine roads? You could construct a pretty amazing Fortress of Solitude-type home base somewhere out in the Great North Woods. Fingers crossed we’ll find out.